Carve Me A Bear! 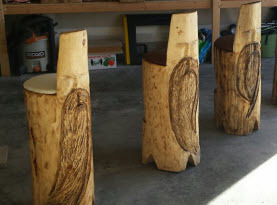 Chainsaw Carvings specializes in the carving of wood with a chainsaw, performed by Clark the Carver who has over 30 years of experience creating and pursuing his passion. 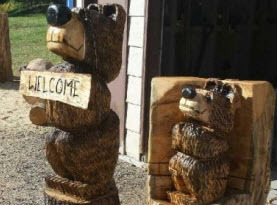 Creating custom and unique sculptures, statues, and signs, Carve Me A Bear! 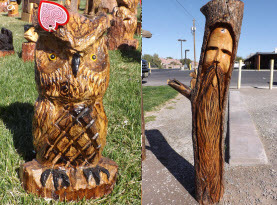 Chainsaw Carvings can create your favorite animal as well as crafting tikis, totems, signs, mantels, furniture, flower pots, memorial planters, and even turn a dead stump into an intriguing piece of art in your landscape. Carve Me A Bear! Chainsaw Carvings understands the bond between owners and their pets. We grow an attachment to our animal family members and all too soon they leave this world for whatever is next, but the impact they had on our lives will forever be treasured. To honor these special loved ones, Clark the Carver of Carve Me A Bear! 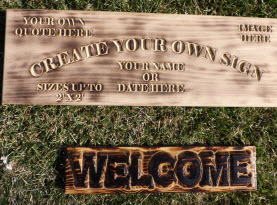 Chainsaw Carvings crafts pet memorials. Some of our offerings include custom made name plaques, sculptures of their pet’s likeness, memorial planters, and other fine works of art. Not that we need reminders of the place in our hearts that they have etched, but having the tribute placed in their memory within the landscapes or in our homes is something that appeals to many. Such memorials have been expertly and tenderly created for countless people in the Las Vegas, NV Valley. One such example was for a fallen Las Vegas Metro K9 officer, Nicky. To honor her sacrifice, Clark the Carver passionately carved Nicky, a Belgian Malinois and proudly presented the chainsaw carving to Nicky’s handler and partner, Sergeant Kerns. On February 12, 2016, it was reported that Nicky, a valiant and courageous officer repeatedly took stabs and cuts to the face with a machete from an armed assailant. After recovering from her vicious attacker, she was eager to get back to work, and to protect and serve as she so loved doing. But alas, Nicky would tragically fall to fatal gun shots on March 31, 2016 in an effort to apprehend a remorseless gunman. The gunman was documented to be firing wildly into a residential neighborhood. Nicky, an 8 year old Belgian Malinois and his heroic partner, Sergeant Eric Kerns were quick to respond in an effort to contain the event before innocent lives were lost. When Nicky and Kerns were confronted by the gunman, a rapid exchange of fire was exchanged. When the smoke had faded, and the incident dissolved, Nicky was found, having received a number of shots, and sadly was unable to survive the multiple gunshots. A fallen hero, doing what the duty that was loved until the bitter end, Nikki would be immortalized in a beautifully hand carved chainsaw sculpture. If you would like Clark the Carver of Carve Me A Bear! Chainsaw Carvings to create such a priceless memorial for your pet, please contact us. We will happily design a special pet memorial for your loved one or consult with you on your own custom project.